Discussion in 'Testing Feedback' started by Red Five, Aug 31, 2018. We've changed how your Tactical Mods are dispensed, making it easier to find what you want. Your Dispenser now grants slot-specific Tactical Mod Capsules. When opened, these capsules allow you to select a mod for that for that slot. These capsules stack in your inventory, so you can always be prepared to upgrade your gear. Tactical Mod upgrades from your Base Mainframe now upgrade the capsules, improving your mods and adding new options for you to select. Please try it out, and let us know what you think in this thread. Thanks! I would like to delete the old Tactical Capsules as I've saved a few hundred. Can you design the old ones so we can delete them? And thank you BTW for making these! They're a great QOL improvement! I believe they still have the wrong icons. “I would like to delete the old Tactical Capsules as I've saved a few hundred. If you have a character slot you can simply give it to your fresh out of brainiac ship toon and delete that toon with all the tactical mod capsules. Hope that helps. Otherwise start opening them I guess. 1. I noticed that all of the Dispenser boxes are now alphabetized except for the Tactical Mod Capsule III - Helmet box. Can the default order for that list be alphabetized? It would help quite a bit since the different types of head mods are mixed in together. Finding anything in that list is always error-prone. 2. Supercharged Neo-Venom Boost isn't available in the Tactical mod helmet box. Who do we have to ask/bribe to get that created/added? 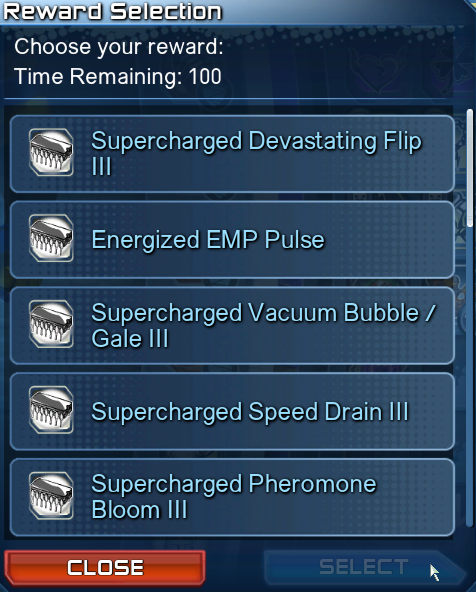 It is the only supercharge that doesn't have a Supercharged mod. Oh my gosh, yes, please! Yeah this incorrect sorting is a known issue that we're looking into. Red Five - any plans on adding more types of tactical mods working with different powers? Right, I'm aware. I was thinking of some accelerated/ energized mods for some of those powers, but ty. Can we please get a tactical mod page/tab like augments? So with new gear we don't have to always run to the base an install it. Make it like augments, we pick and save the ones we are using. It would make swapping them out in raids etc. A lot easier. you could easily just keep a stack of each box in your inventory, then just refill it when you get low. The individual mods don't stack but the boxes do (or at least should, since the previous one that had all the TC ones did). Just keep stacks of tactical mods in your inventory. That's what I did leveling up my Hard Light toon. New gear drops...cut scene I equip me gear and open tactical mod to put on. Easy Peazy bro. See u online.